Mass customization and build to order - articles, books, consulting & seminars. Build-to-Order and Mass Customization represent a viable business model that offers an unbeatable combination of responsiveness, cost, and customer satisfaction. Click on image for details of book on "Build-to-Order & Mass Customization" of click "books" icon above. Build-to-Order Read Recession Strategies on ways BTO can help immediately. Build to order enables the manufacture of any quantity of standard products on-demand without forecasts, inventory, or purchasing delays with unique Spontaneous Build-to-Order methodologies. Customized in-house seminars and consulting show how to implement BTO. Mass Customization enables manufacturers to build products on-demand that are mass customized for niche markets, various countries, or individual customers with Mass Customization techniques. In-house seminars shows how to implement mass customization. (2) Part Standardization and raw material standardization. Cut product costs in half using the above techniques to reduce overhead costs and DFM to achieve the lowest fabrication and assembly cost with the highest quality by design – based on a forthcoming book. Use Build-to-Order and mass customization to build products on-demand to satisfy industrial customers, mail order, or rapid on-demand replenishment of stores for Lean Retailing resupply. Build-to-order and mass customization represent a viable business model that offers an unbeatable combination of responsiveness, cost, and products that customers want when they want them. It enables companies to build any product -– standard or custom -– on demand without forecasts, batches, inventory, or working capital. Read the article Recession Strategies to find out how BTO can immediately lower costs, improve profits, and free valuable resources to improve operations, quality, and product development, without major capital costs. Build-to-order and mass customization companies enjoy substantial cost advantages from eliminating inventory, forecasting, expediting, kitting, setup, and inefficient fire-drill efforts to customize products. BTO results in more efficient utilization of people, machinery, and floor space. Build-to-order and mass customization substantially simplifies supply chains – not just "managing" them – to the point where parts and materials can be spontaneously pulled into production without forecasts, MRP, purchasing, waiting, or warehousing. Build-to-order and mass customization is the best way to resupply parts to OEMs or products to "lean retail" stores who demand rapid replenishment, low cost, and high order fulfillment rates without the classic inventory dilemma: too little inventory saves cost but increases out-of-stocks, missed sales, expediting, and disappointed customers; too much inventory adds carrying costs and costly obsolescence. Build to Order and mass customization companies can grow sales and profits by expanding sales of standard products in addition to customized, derivative, and niche market products, while avoiding the commodity trap. BTO companies are the first to market with new technologies since distribution "pipelines" do not have to be emptied first. The mass customization capabilities of build-to-order can quickly and efficiently customize products for niche markets, countries, regions, industries, and individual customers. Would you like to enquire further? ustomization, build to order, flow, lean production, JIT & standardization: leading-edge consulting, seminars, articles & books on the ultimate in supply chain management, cost & agility. 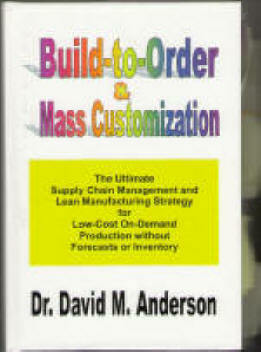 Mass customization and build to order - articles, books, consulting and seminars. Simplify your supply chain, extend lean production to build mass-customized or standard products on-demand. Mass customization, build to order, flow, lean production, JIT & standardization: leading-edge consulting, seminars, articles & books on the ultimate in supply chain management, cost & agility.